Welcome to the ancient Egyptian-like world of Amonkhet, ruled by the mysterious all-powerful dragon planeswalker Nicol Bolas! What has he been doing here all these years..? Dive into Amonkhet AKH to find out! Loaded with new cards and mechanics like Exert, Brick, and Embalm, Amonkhet cards can add tons of power and tricks to your existing Magic deck or be the basis for a whole new deck! 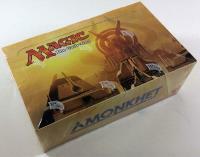 This listing is for (1) brand new factory-sealed Amonkhet booster box from manufacturer Wizards Of The Coast. Each Booster Box contains 36 packs of 15 random cards each from the Amonkhet set, try to collect them all! Each booster pack is guaranteed to contain at least 1 (Rare) card and 3 (Uncommon) cards, as well a chance to find randomly inserted Mythic and Premium foil cards in some packs! There will also be new full-art land cards randomly inserted in every 4 packs on average!